After my tranquil Tranquille afternoon, I headed over to the south side of Kamloops to see what was going on at the CP side of things. I'm a little confused on the timing of this train but I think all units are the same train. The time stamps are off because the first photo was taken with my Canon and the other two were taken with my iPhone. CP 8739 and 5004 were the leaders. 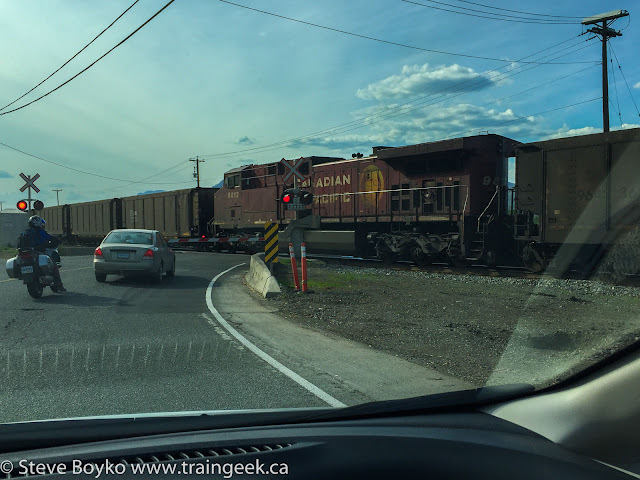 I think they must have been the same train because there's no way two westbound coal trains would have passed by me within two or three minutes. I just can't figure out why I would have used my Canon for one and then sat in my car for the other two. Anyway. 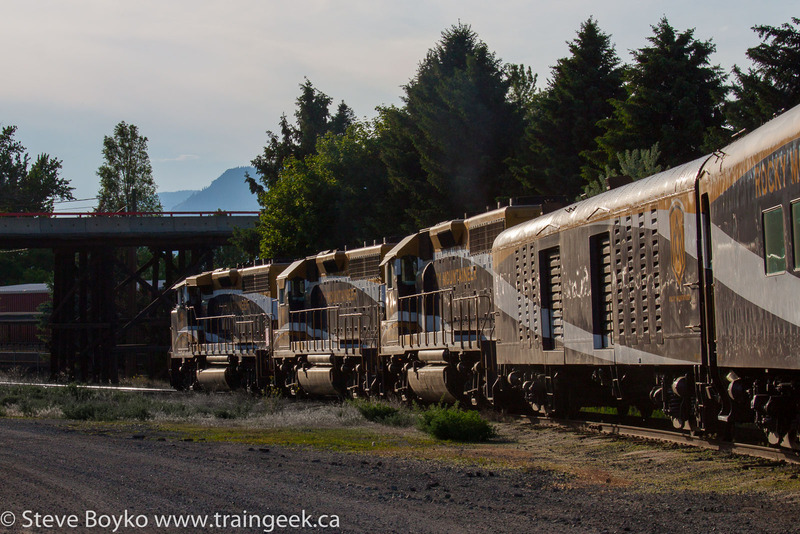 After the coal train passed, I went down to the Weyerhauser Domtar mill and spotted spreader CP 402880 and plow CP 400648. There is a wye there that used to service a sawmill and it is a handy place to park equipment, I guess. I spotted a Sperry "doodlebug" there back in August 2013. I headed back to downtown Kamloops after that, because I knew the Rocky Mountaineer was due in. Very exciting! 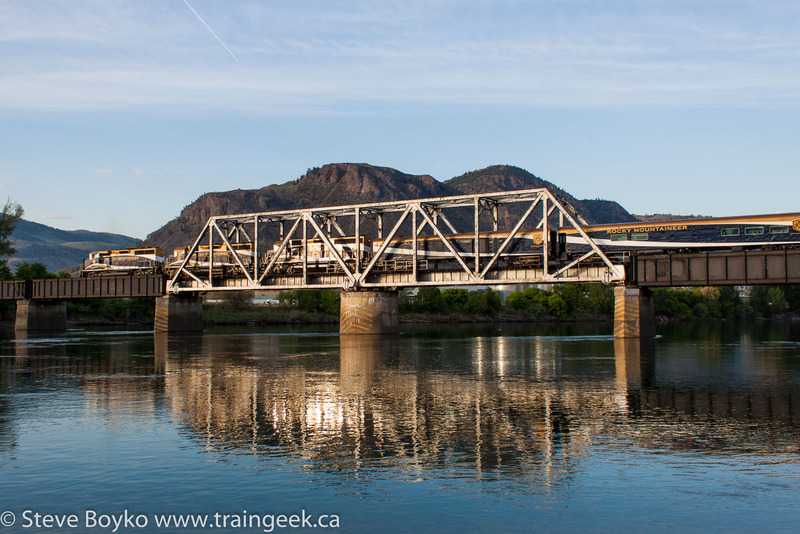 I have been to Kamloops several times but always when the Rocky was not running, so this was my first chance to see it in Kamloops. There were several busses arriving by the former CN station (now a Keg restaurant) and I asked one of the bus drivers when the train might show up. He said it was arriving at 7 PM, and sure enough I spotted it coming off the CP main line at 7 on the dot. 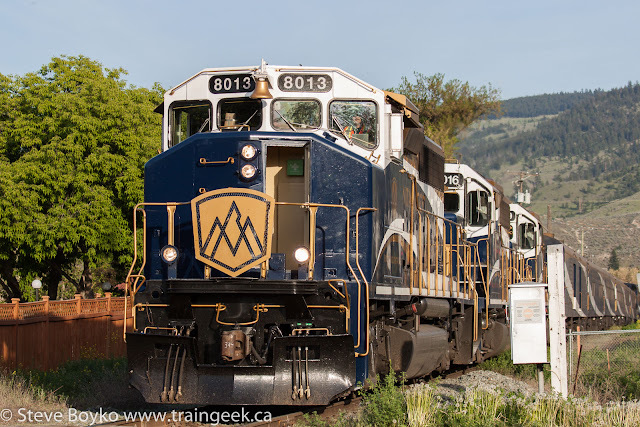 This train was coming from Banff and had to get onto the CN Okanagan subdivision to A) drop passengers off at the station and B) proceed to their depot in the CN yard. 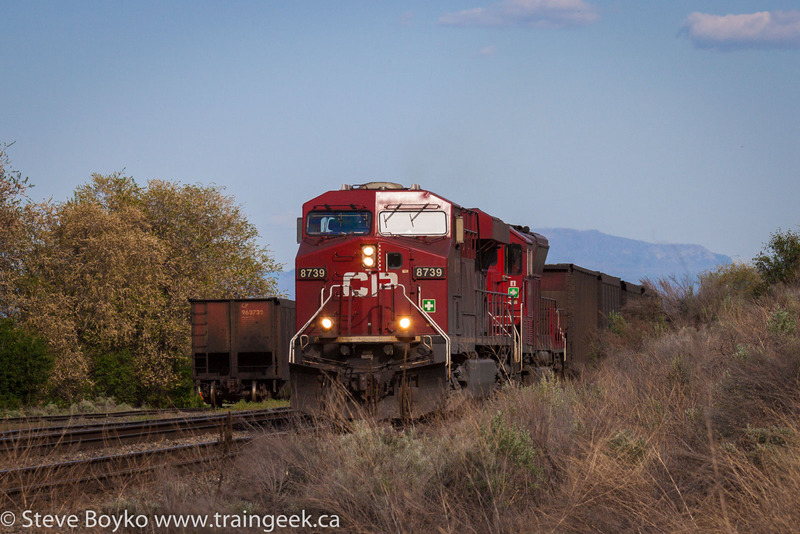 Here's a little glint shot as they roll under the Red Bridge just before stopping at the station. 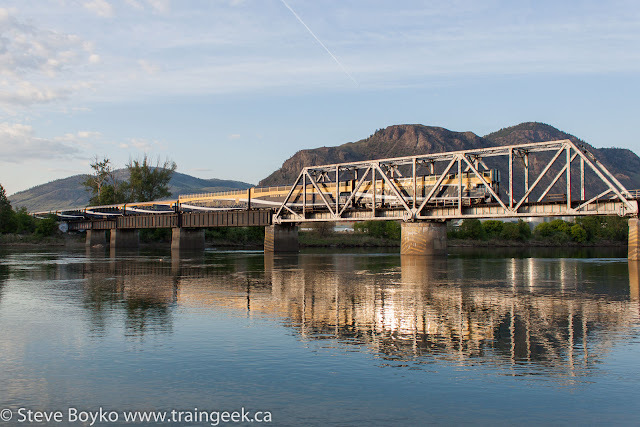 The main building of the Kamloops Heritage Railway is visible under the bridge. I have to say that the onboard crew appeared to be universally cheerful. Nice wave from a pair of them here! They disembarked the passengers at a reasonably brisk pace. 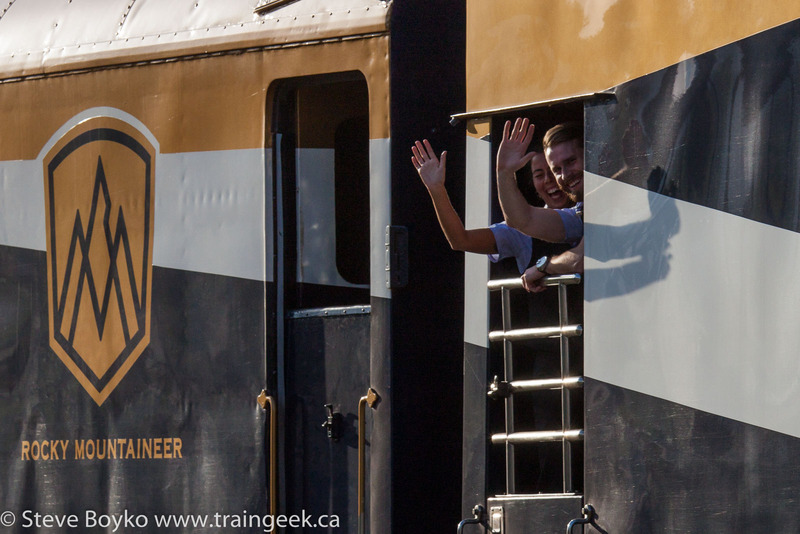 They were at the station for just over 30 minutes, so I didn't have a lot of time to grab photos. 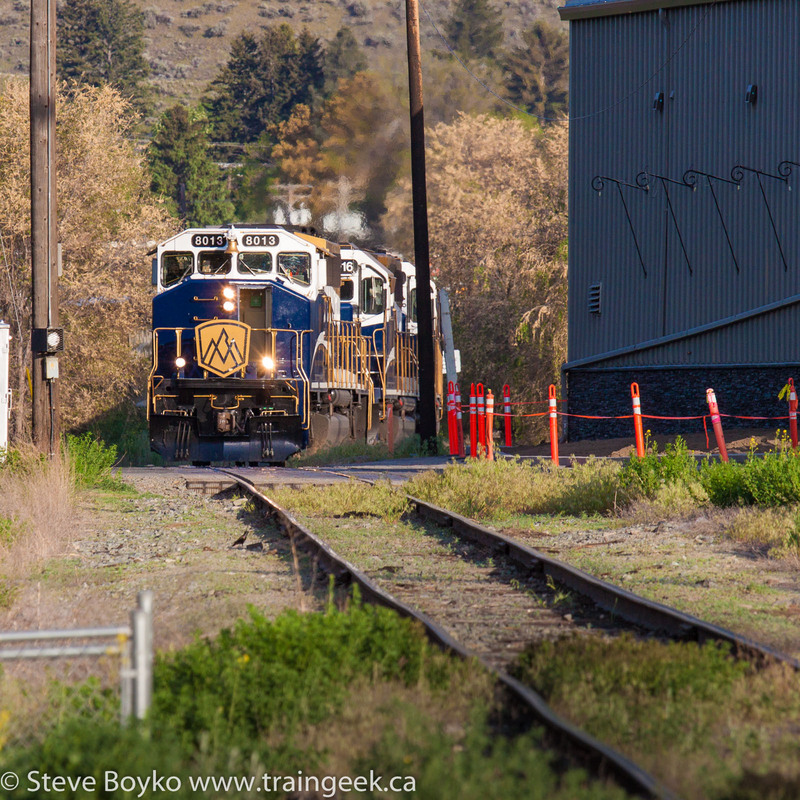 Here's a photo showing the train in downtown Kamloops at the teeny CN yard there. The KHR is just visible to the left with a stub end track. The former CN station is visible behind the garish yellow CN "no trespassing" sign. Off camera to my right is the Interior Savings Centre, a multipurpose facility hosting the Kamloops Blazers hockey team as well as a prime concert venue. I was fortunate to see Sarah McLachlan there on my last visit (for maybe the 5th time?). After taking a few photos of the stationary train, I went down to the South Thompson River. 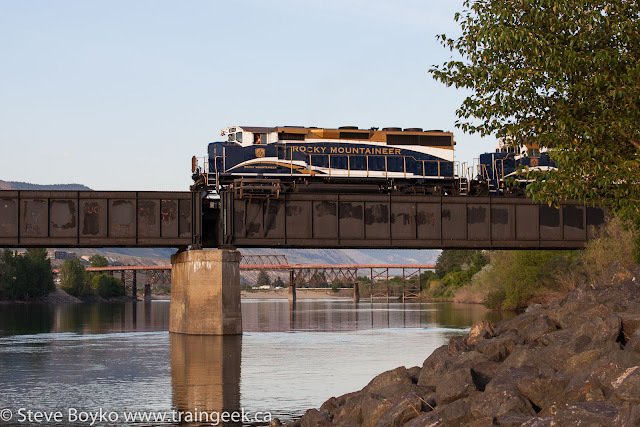 I've wanted to capture the Rocky Mountaineer on the bridge over the river ever since I first visited Kamloops, and this would be my chance. RMRX 8013 came into view first. Note the Red Bridge in the background. They crept across the bridge, and I was photographing away, waiting for the perfect opportunity... wait... wait... NOW. That's what I came for. W00t! One final frame, and we're good for the night. Next up.. CP in Savona, more Rocky, lots more CP, and back to Tranquille. Read on! Thanks for reading! I like the old CN first aid kit (green) inside the door of 8013. 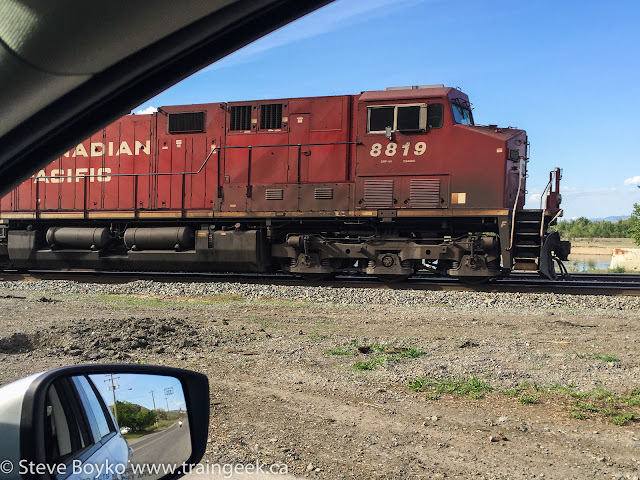 I still see them from time to time at ex-CN locations and on ex-CN roadpower. Wow! Great photos again Steve of the Mountaineer! 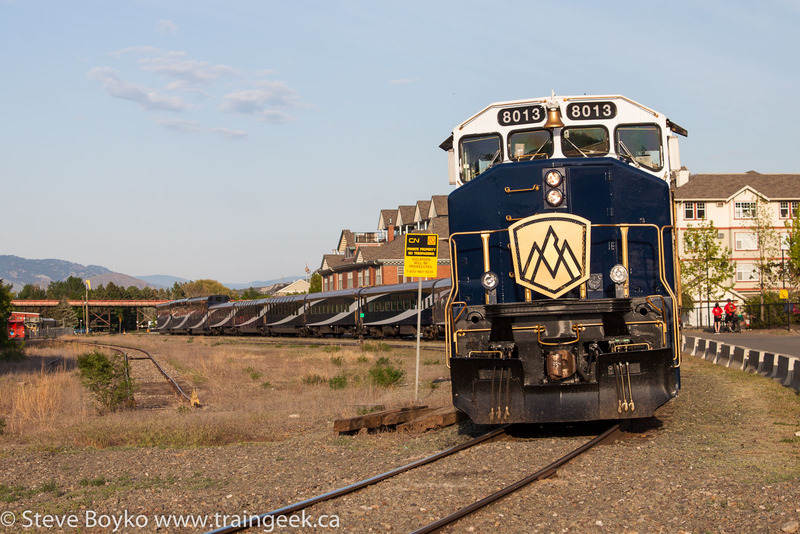 Thanks, Jason, it's a pretty train!